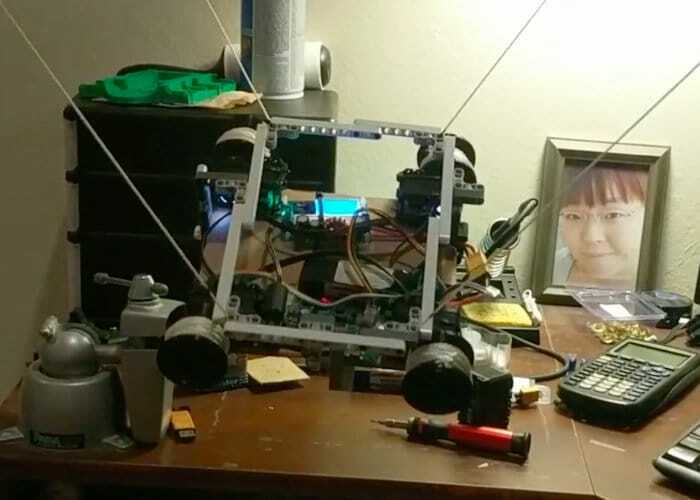 An interesting Arduino project has been created by Nathaniel Nifong and kindly published to Reddit, offering insight on how to create your very own DIY ceiling mounted cable robot powered by an Arduino Mega development board. More commonly associated with sporting events cable robots offer an easy way to view the action on large pitches and are normally mounted with cameras and microphones. Although Nathaniel has decided to create his very own and mounted in his living room to create his very own Skycam-like robot. “This is the first wireless movement demonstration of a robot I’m building. It’s based on parts from an XYZ 6-DOF robotic arm. The Bluetooth control is done by using Nordic toolbox to send commands to a an MDBT40 Bluetooth module that was reprogrammed with an ST-Link V2. The module forwards the command to the Arduino. Commands are to move 10 cm in any direction. It calculates what the change in rope lengths would be to achieve the new position.” Watch the demonstration video below to learn more about the prototype cable robot. For more information jump over to the official Reddit website by following the link below.